Merced's first court hearings took place under a tree on a local ranch that had been designated the county seat after the county separated from Mariposa in 1855. 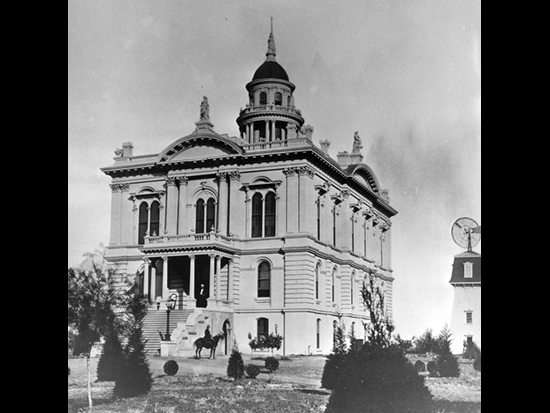 Construction was begun in 1874 on this grand Italianate building designed by Albert A. Bennett, one of the architects of the State Capitol Building in Sacramento. The courthouse is adorned with three statues of Justice and topped by a statue of Minerva, the Roman goddess of wisdom. It was used as the county courthouse until 1950, when the courts moved to more modern offices. Renovation of the building began in 1975, and the courthouse was rededicated as a museum in 1983. It is listed on the National Register of Historic Places.